While battling facial acne is hard enough already, some women also face body acne, especially on their backs. This problem is all too common than most women think. There's good news, however -- here's how to banish bacne for good, according to dermatologists and other skincare experts. Believe it or not, most body acne is caused by pores becoming clogged from sweat. This is because the clothes you wear, including sports bras, can trap sweat and bacteria, leading to unsightly breakouts on your back and other parts of your body. It's important to understand that not all acne is created equal. Acne found on your face and back is usually caused by bacteria, increased oil production, irregular skin cell turnover, and pore blockage. This leads to whiteheads, blackheads, and zits. But the skin on your face has more blood supply, which means acne tends to heal faster with minimal scarring. The skin found on your back, however, is thicker, requiring stronger acne treatments to battle outbreaks. 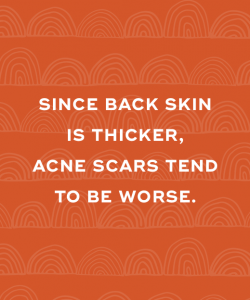 Since back skin is thicker, acne scars tend to be worse. salicylic acid or higher. Salicylic acid unclogs hair follicles by loosening sticky cells and oil, reducing the frequency and severity of outbreaks. Similarly, benzoyl peroxide unclogs hair follicles by clearing dead skin cells. It also reduces inflamed pimples and kills blemish-causing bacteria. 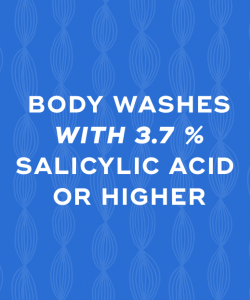 You should use body washes and scrubs that contain either salicylic acid or benzoyl peroxide every single day. Shower after exercising. Because sweat is one of the main causes of bacne, it's crucial that you immediately shower and change clothes after hitting up the gym. This will help prevent your pores from becoming clogged. Wash your sheets often. While you sleep, your body can transfer bacteria, oil, and dead skin cells onto your sheets, causing breakouts. That's why it's important to wash your sheets on a regular basis. The same goes for towels. Say no to spandex. Spandex is notorious for trapping oil and sweat against your skin, leading to unsightly breakoutson your back and other parts of your body. You should switch to wearing cotton clothes that allow your skin to breathe. Take more baths. Soaking in a tub with Epsom salts and oatmeal can help reduce body breakouts. Epsom salts dry out oily patches and soothe irritated skin while oatmeal soaks up excess oil. Soak for at least a half hour at a time. Be careful with hair products. Using conditioner in the shower can transfer to your back area, clogging pores. After shampooing and conditioning your hair, always follow up with a body scrub to remove any residue. Use tea tree oil. Tea tree oil is an all natural skincare product that has antibacterial properties. Spot treat blemishes by applying tea tree oil to your skin using a cotton ball. It deeply penetrates clogged pores, instantly healing blemishes. Try scent-free laundry detergent. Skin can become easily irritated and clogged from scented laundry detergent. 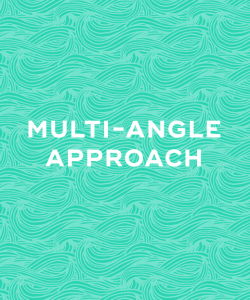 Try switching over to a scent-free hypoallergenic formula to help combat body breakouts. Exfoliate regularly. With bacne, it's key to exfoliate your back on a regular basis. This helps rid your skin of dead skin cells that could be clogging your pores. Reach for apple cider vinegar. Apple cider vinegar is a natural remedy that helps regulate your skin's natural pH by drying out oily spots. Mix one part apple cider vinegar with two parts water. Using cotton balls, apply the mixture to your back at night before going to sleep. Go easy on the moisturizer. If you're using a body moisturizer, make sure it's light. While you should apply moisturizer to your legs and arms, use a light moisturizer specifically designed for acne-prone skin on your back and chest. Continue to exercise. Exercising on a regular basis helps to detoxify your skin, and increase blood flow, resulting in fewer breakouts. But, once again, make sure to shower and change immediately after exercising. but by using body washes formulated for acne, wearing the right clothes, and showering often, you can nib bacne in the bud for good. 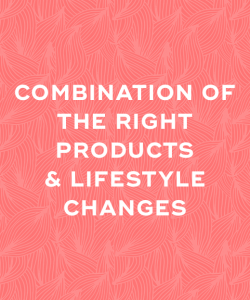 In rare instances, though, you may need to visit your dermatologist for prescription-strength products. "8 Easy Ways to Get Rid of Acne," Cosmopolitan, February 13, 2018. "Back Acne: How to Get Rid of Hard-to-Reach Zits for Good," Self, n.d.
"Banish Back Acne: 10 Simple Tricks to Try," Reader's Digest, n.d.
"How to Get Rid of Bacne, According to Dermatologists," Allure, October 12, 2017. "How to Get Rid of Bacne Fast," Teen Vogue, October 23, 2017.